Mulberries are fast-growing when young, but become slow-growing when they age. Morus trees have short rough trunk and twisted and drooping branches. Their leaves with toothed margins are alternate and simple, lobed on the young shoots and on the old trees. All the parts of the tree contain milky juice. 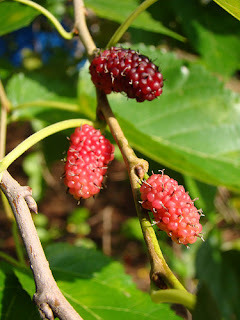 Mulberry may have male and female flowers on the same tree; they are usually wind-pollinated. Many small flowers are gathered in the inflorescences to form catkins, situated in the axils of the leaves. Female catkins are shorter than the male ones. The incredibly juicy fruit of the Mulberry tree is actually a collective fruit, consisting of closely-situated drupes with one seed inside. 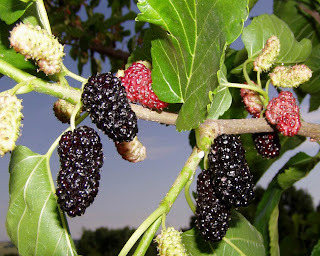 Morus nigra, or Black mulberry, is the most widely-known and grown tree for its fruits, which are larger than in the other two species. It reaches about 40 feet in height, having a wide and spreading crown, which in diameter may even exceed the height of the tree. It is a long-lived plant. 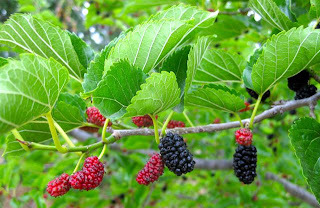 The large, thick, and quite rough leaves of the Black mulberry are similar to those of the Morus rubra (Red mulberry). The fruits of the two species are also very alike; except for the Black mulberry fruits are darker in colour. Morus alba is the tallest tree, reaching up to 80 feet. 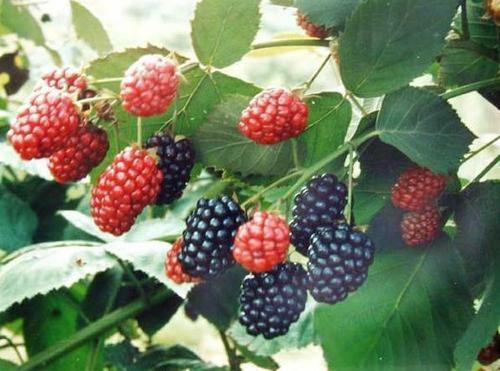 Its fruit, smaller than in the other two species, is, however, very sweet and lacks the tartness of the Red and Black mulberries. White mulberry is native to China. 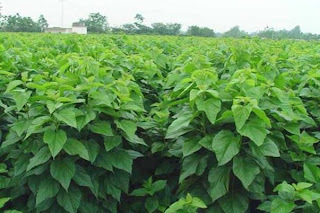 It grows well in almost any type of soil and tolerates drought and cold temperatures. It can be grown practically anywhere in the world. 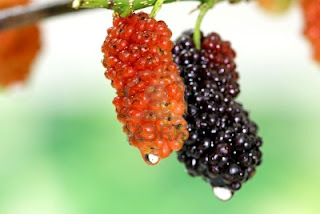 Black and Red mulberries are more fastidious: they need warmer climatic conditions, more fertile soils (preferably a deep loam), and good drainage with timely watering, however. These trees need full sun and much space for their large crowns. At the same time, they are wind-tolerant. Black mulberry originates from western Asia (Armenia, Persia, Azerbaijan, Pakistan, etc. 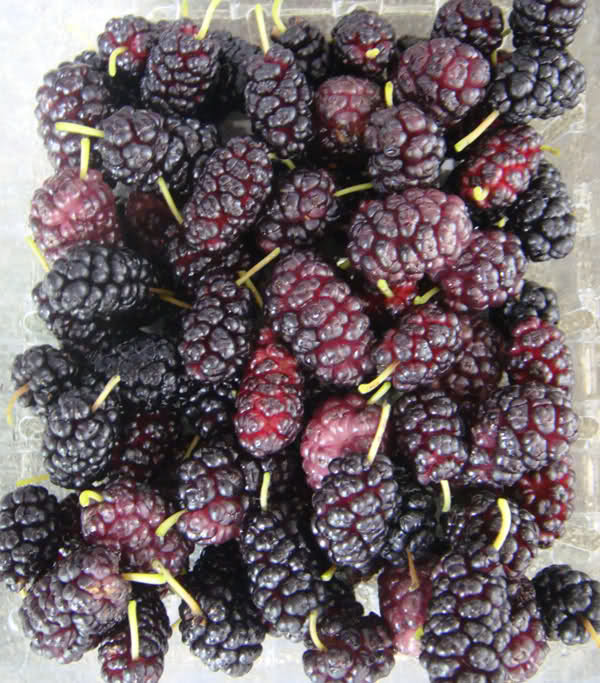 ), while Morus rubra comes from the United States. These days fruits of the Mulberry tree are widely-popularized as valuable health-promoting and nutritionally-rich foods. Some sources even state that Mulberry may be included into the list of the super foods due to its potential health benefits. Nonetheless, traditional herbalism contains many recipes of the remedies made of the Morus tree leaves and bark, which also have medicinal value. The whole spectrum of the beneficial elements may be enjoyed in the fresh fruits of the Morus tree. At the same time, dried fruits, extracts (including leaf extract), and juices are available in the stores selling natural remedies and food supplements. Antioxidants, capable of eliminating the damage caused by free radicals in the body and slow down the process of aging, seem to be the main constituents of the fruit juice of the Mulberry tree. Scientists mention resveratrol as the most promising component in this respect. For this reason, they now try to discover as much as possible important information about this element. It is suggested to have cardio protective, antiviral and anti-cancer action. It may also lower bad cholesterol and work to alleviate chronic inflammation, as well as postpone the development of Alzheimer’s and Parkinson’s diseases. Anthocyanins – pigments in the fruit – also have antioxidant action; thus, are medicinally valuable as well. They have been studied primarily as the means to fight cancer and showed excellent results. Their content is the highest in the fruits, which are grown in the warm climate with much sunshine. Flavonoids in the root bark of the Mulberry tree were discovered to increase the level of insulin in the body and reduce blood glucose level; therefore, they may help in controlling diabetes. The root bark is considered a mighty diuretic and expectorant. The bark of the tree has anthelmintic property. 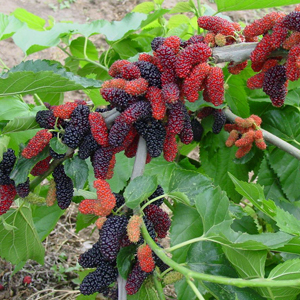 Mulberry leaves are used to treat diabetes and hypertension, but the old leaves have tranquilizing properties and may cause hallucinations, headache, and upset stomach, so, their remedies should be used with the extreme caution. 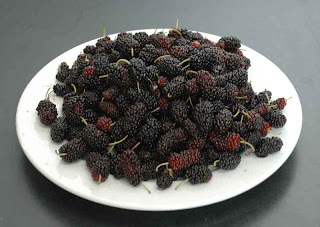 Mulberry contains large amounts of vitamins C and K, minerals magnesium, phosphorus, potassium, calcium and iron, carbohydrates glucose and fructose, free acids (tartaric and malic), fatty acids (linoleic, stearic, and oleic), protein, pectin and fiber. The health benefits of the Morus tree are tightly connected with the elements composing its chemical structure. Lately, fighting diabetes and cancer with Mulberry became the primary issue of scientific research. 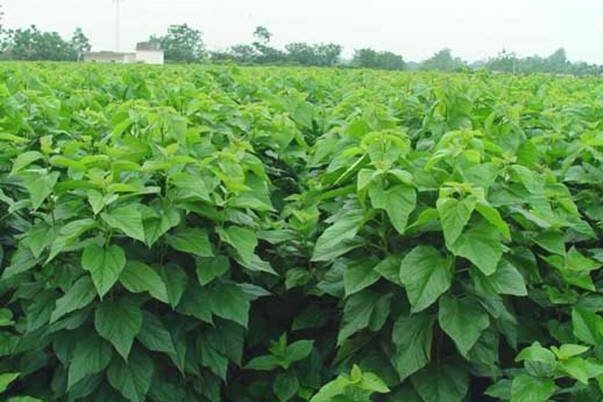 These diseases are difficult to manage and Morus fruit seems to possess the necessary properties, which could be of great help in controlling these conditions. On the other hand, strengthening the immune system, relieving pain from chronic inflammation (for example, caused by arthritis or atherosclerosis), and nourishing the blood have a long history of treatment with Mulberry fruits. In addition, naturopaths recommend to lower bad cholesterol levels (thus, helping to avoid the development of cardiovascular disorders), shed excessive pounds, increase bone strength and fight osteoporosis with Mulberry remedies. Besides, maintaining healthy liver and kidneys, soothing the nerves, eliminating weakness, fatigue, and anemia is possible with them. It is interesting to note that premature graying of the hair may be stopped with Mulberry and even increasing low libido is possible with its fruits. 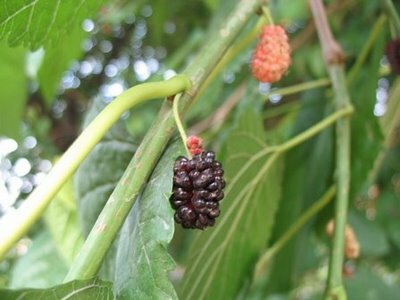 Do not forget that the treatment with Mulberry remedies is not only effective against the mentioned disease, but pleasant due to the taste of the fruits as well. This plant is grown easily by just breaking a branch and plant it straight into the ground. It grows very easily under any environment in tropical climate. Normal watering and a little care will make you extremely satisfied at the end of the day when you get to see and enjoy the sweet flavor of this lovely fruits. A SPECIAL TIP FOR EVERYONE. AFTER PLUCKING THE RIPENED FRUIT (DARK PURPLISH IN COLOR), YOU WILL GET THE DARK STAINS OVER YOUR HANDS AND FINGERS. TO REMOVE IT, JUST PLUCK A FEW OF THE RED FRUITS (THEY ARE THE UNRIPENED ONES) AND THEN, SQUASH THEM IN YOUR PALM WITH YOUR FINGERS. THE SOURISH PROPERTY WILL HELP TO REMOVE THE STAINS ALMOST INSTANTLY.